The purpose of Alpha Sigma Alpha is to foster close friendships between members and to develop women of poise and purpose. 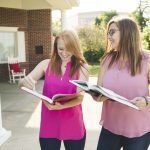 Being an AΣA member is a lifelong commitment that allows you to stay connected with old friends and get connected with new ones. We encourage all of our members to be active in your communities, stay involved in the lives of your sisters and continue the conversation to help build a better legacy.